We just returned from our Cozumel scuba diving vacation (November 9-16, 2007). It was our first time back since Wilma hit in 2005 and we weren't sure what to expect. While some things have obviously changed, we found the island in good shape, both above water and underwater. We've been to Cozumel several times and always loved it. It makes our list of best places to scuba dive in the Caribbean. We were hoping that wouldn't change going back after Hurricane Wilma. Thankfully it didn't. Going to our hotel from the airport was a pleasant surprise. While you can see the damage to the vegetation, it is coming back. Trees have been replanted, vegetation is growing again and the island is green. There aren't the tall palms like there used to be, but they are on the way. There is quite a bit of construction still going on in town and around the island. Some appears to be repairs from the hurricane and some is renovation/new construction. You see advertisements for new condo's/hotels in all the publications and on road signs. To me, this is a downside to the popularity of Cozumel. The island has become much more developed over the years. 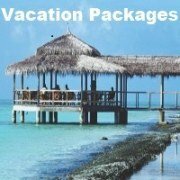 Not much you can do about that but you can still enjoy your Cozumel scuba diving vacation with all the great sights underwater. 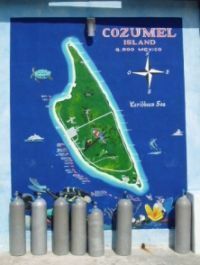 Cozumel has lots of wonderful dive sites. And I am happy to report, the diving is still wonderful. 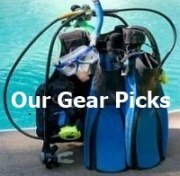 We did 8 dives during our Cozumel scuba diving vacation and we were not disappointed. 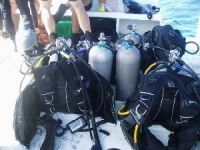 During this trip we dove Palancar Gardens, Palancar Caves, the end of Palancar, Cedral, Santa Rosa Wall, French Reef (La Francesa), Santa Rosa Shallows and Columbia. The deep dives were all great. We didn't notice anything significant from the hurricane. Maybe someone that dove those sights everyday would see differences, but not us. The walls were in good shape with lots of formations, marine life and interesting swimthrus. On spots on the shallow dives, you could see sand still on the reefs from the hurricane. While some of the reefs at spots weren't pretty due to the sand, there was still plenty of marine life. On these dives we saw lots of turtles, including one of the biggest we have ever seen while diving. Other marine life we saw during this Cozumel scuba diving vacation were sharks (most resting under a ledge), tons of angel fish, parrotfish, rays, rock fish, barracuda, huge crabs and lobster and even a seahorse, to name a few. After the diving on this trip, I would go back on another Cozumel scuba diving vacation in a heartbeat. Cozumel diving - Mexico scuba at its best without a doubt. The weather while we were there in mid November was nice. Air temperatures were in the mid-80's during the day and cooling off to the mid-70's at night. It rained at night a few times but we were sleeping so who cares? One day it was cloudy and rainy in the morning. The rain let up but the clouds stayed. It was only one day so it was no big deal. Certainly not enough to put a damper on our Cozumel scuba diving vacation. We were at our safety stop that morning and could see the rain coming down in torrents while we were under. Gave us something to watch while we were hanging. 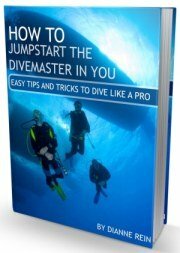 I didn't have a thermometer on my dive computer but the divemaster said the water temp was around 80-82F. My husband and I both wore a skin and we were fine. Most people wore a wetsuit but there were also quite a few people who didn't wear anything (other than a bathing suit, of course). During this Cozumel scuba diving vacation, we dove with Dive Palancar who were the dive shop operators at our hotel (Occidental Grand). They were good and very professional. Out of all the divemasters we had, only one was inattentive and I wouldn't want to have him again. The rest were good and went out of their way to point things out to the divers. 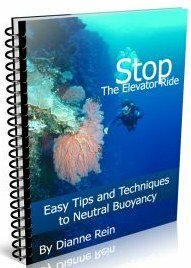 While the dive boats were crowded at times, they do limit 8 divers to each divemaster. 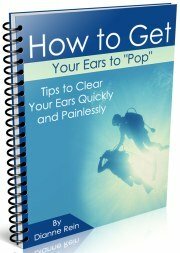 This at least helps underwater to thin the crowds out. 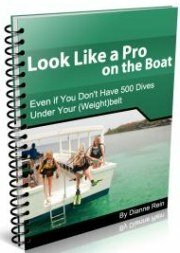 Some people had different dive operators pick them up at the dock and that did not seem to be a problem. We booked a package of dives (there were 4 of us diving) so we paid $29 each dive. The normal price was $32/dive. Since we booked a package they did not charge us for the equipment rental. My husband and I needed BC's since we didn't bring ours. The normal price for a BC rental there was $6/day. One of the drawbacks of diving in a great spot is its popularity. We were there in low season and the dive boats were busy. During our Cozumel scuba diving vacation, we stayed in a hotel that was on the south end of town, right in from the Santa Rosa Wall (talk about convenient). When we weren't diving (and when we were diving), we would watch all the dive boats going back and forth all day long. So divers are back and I'm sure it will only be busier in the high season. 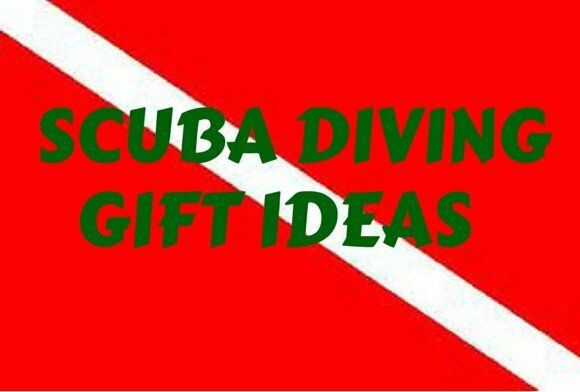 All of which is good for the dive shop operators on Cozumel. The worst and best spot as far as scuba diving in Cozumel Mexico this trip was the Santa Rosa wall. It was a great dive as far as the wall and sightseeing went. The current was the strongest there so we got a nice ride. 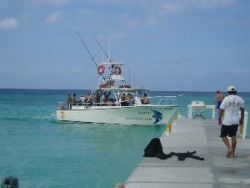 However, it is also one of the most popular dive sights in Cozumel and the crowds prove that. While we were scuba diving there, another dive boat dropped its' divers right on top of us. 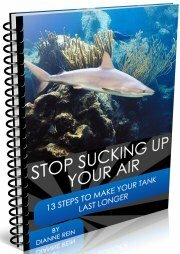 Our divemaster was not happy - "Those ****, can't they see our bubbles and drop down somewhere else?" And more along those lines. To me though, it wasn't as bad as last time we dove there when we called it D-Day due to all the divers dropping down. It was close, but not quite as bad. While we ran into other divers on some of the other dives, it was OK. Not too many and not dropping down on top of us. 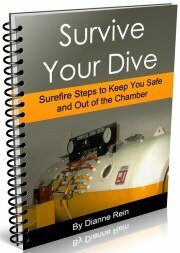 Scuba Is Done - Now What? We did our favorite thing after finishing up our scuba diving in Cozumel, Mexico. Rent a Jeep and tour the island. Roads on one side of the island are still washed out so be careful driving. What's a trip to Cozumel without some beach bars and wave watching? The waves were crashing and it was great to watch. The rasta bar Freedom in Paradise took over the bar across the street (near the entrance to the lighthouse at Punta Sur). We hung out there for while and then continued the tour. Didn't make it up to Coconuts this time (one of our group was using a walker), next time. 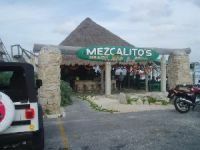 Stopped at Mezcalito's - alot of their beach has washed away. Went over to Senor Iguana's since they offered a great deal on beer and free chips. Hey, why not - spread the money around. All in all, had a great day and a nice ending to our Cozumel scuba diving vacation. Have a great trip to Cozumel!